Running While Pregnant: Is It Safe to run during first, second and third trimester? The old wives tales went around suggesting that running while pregnant is forbidden and a pregnant woman must take 9-month bed rest. It felt like a pregnant woman is more of a sick patient than a Goddess going to give birth to a new life. Thank science that now you don’t have to sit at home and stuff yourself with unhealthy extra fatty stuff. Instead, now it is well known that a pregnant woman should stay fit for herself and her baby and running while pregnant is not forbidden. A pregnant woman goes through a complete transformation during her pregnancy. The joints loosen up, and the shoe size may increase by a number. There is a major concern about getting stretch marks post pregnancy. For the protection of your growing baby, a lot of fat is stored in your body for insulation. Double chin and bulging belly is a common problem in pregnant women. In case you do not want to give up on your daily running routine. It is a good idea. If you are new to running it is not something that is going to be difficult. You can always control the duration and intensity of your workout. Running while pregnant isn’t easy as you have a considerable load attached to carry along. Can running cause a miscarriage in early pregnancy? In the first trimester, your body undergoes a lot of changes, and a slight mistake can lead to miscarriage. In the second trimester, your belly increases exponentially in size. The third trimester has the risk of inducing labor due to physical activity. This is the reason why it is best to keep a regular workout routine that is not very strain full. How much can you run or walk while pregnant? Running while pregnancy is good for you and your baby as it helps enhance your blood circulation. It will help you gradually gain weight and stay healthy. It will also help you during labor as you will be stronger. Running during the first trimester requires a lot of precaution. During first-trimester baby’s organs are forming and it involves a lot of energy. A slight jolt to the abdomen can lead to miscarriage. Most miscarriages occur during the first trimester of pregnancy. While running during the first trimester of pregnancy one must make sure to stay hydrated. It is also important that you wear the right sports outfit. Track pants without any hanging straps will ensure that you don’t trip. Avoid wearing bralets and instead, wear a sports bra. It will keep your breasts in place. Also, do not forget wearing good quality sports shoes. It is essential to wear the right kind of shoes while running during pregnancy. Avoid exposing the baby bump to the harsh sun. If you are not used to running then try walking. Running while pregnant can heat up your body and this is not good for you. If you live in a hot climate zone, then avoid running out in the sun. Opt for brisk evening walks. Walking inside a shopping mall isn’t a bad idea too! These precautions for running while pregnant are common for all trimesters. It is important to replenish what you lose during a workout. Sweating makes you lose a lot of salt. Your body can quickly go in a state of dehydration during pregnancy. Take lemonade or fruit juice bottle along when running while pregnant. During the second trimester of your pregnancy, your baby bump grows and becomes noticeable. The increasing weight can quickly make you misbalance and fall. Also, the expanding womb puts a lot of pressure on the lower spine. Running also affects the alignment of the spine. It can cause slip disks which are excruciatingly painful and rarely heal entirely even during a lifetime. 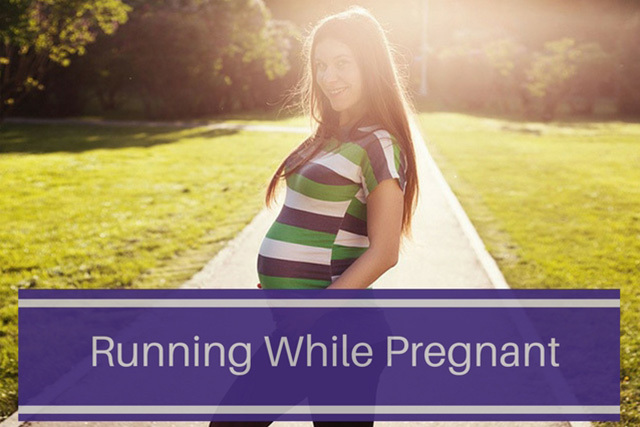 Running while pregnant during the second semester needs a particular emphasis on the posture. Make sure you keep your chin up and spine straight. Don’t bend or run with a curved back. Avoid running too fast down the slopes. Also, make sure that you have someone along. Don’t run on rocky terrain and instead run on grassy lawns. Change your path of running. Change your workout schedule depending on the need for adjusting to the changes in the belly. Carry a water bottle along. Mix electrolyte powder in your water to quickly replenish the lost ions. Never run on a full stomach. Eat a light breakfast before running. A bowl of fruits along with some buttermilk or yogurt will make an excellent pre-workout snack. Running during the third trimester of pregnancy helps to keep you healthy for labor. Running during the third trimester will help you have a more natural labor. It keeps all the fluids in motion. Your baby enjoys the gentle rocking and thumping motion too. However, running while pregnant in the third trimester is the toughest. All your joints loosen in the third trimester. The loosening of joints of legs is due to the hormones responsible for relaxing the pubis symphysis. It is the cartilage that joins the two pelvic bones. It is for the act of delivering the neonate. As a result, joints of legs also loosen up. Running can apply excess pressure on these loosened joints. It might lead to pain and sore feet. Pregnancy leg cramps already give you sleepless nights. It is important that someone accompanies you running during third pregnancy trimester. Anything can happen at any time. Premature labors are not uncommon. Running while pregnant during the third trimester is something you must discuss with your doctor. Jogging while pregnant or walking during pregnancy have a lower risk even in case of complications. Running in early pregnancy miscarriage is a case where the baby is at risk. A woman with a low lying placenta is at the risk of internal bleeding. The entire womb shifts to the bottom of the uterine cavity. Running while pregnant is not entirely an independent decision that you can take. One must always ask her doctor before starting to run while pregnant. A daily moderate intensity workout of 20 to 30 minutes is the recommended exercise for pregnant women. Don’t push yourself to the extent that your joints start paining or muscles become sore. If you are new to running altogether, then just start with 10 minutes stretching and walking routine. If the mother is healthy and has an active lifestyle since long, then yes! Women are very conscious of their bodies. Breastfeeding helps to reduce pregnancy fat after the delivery. A nursing mother requires more energy than a daily wage laborer. It is vital that you follow the nature’s law and things will themselves fall into place.